Good morning - happy weekend to you all! It's Saturday, and my day to post here on the Great Impressions Stamps blog. would be perfect with the pink, green, and white color scheme. water for the yummy little jelly beans inside! This was pretty easy to do! The card base was created, and scored. A white panel was cut, and adhered to the card base. Then, a white circle and a green circle were created with some circle dies. The white circle was dry embossed with a big 'dotty' folder. The sweet pink paper -it was edged with an old border die. The sentiment was stamped on white, and cut out into the fishtail shape. 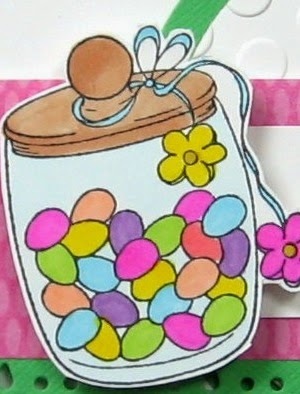 The jelly bean jars were stamped on white, colored with markers and fussy cut. The top jar is adhered directly to the card front. The pink strip is mounted with very thin dimensional foam. The jar on the left was adhered with a thicker dimensional foam. This one just made me smile - how about you? Be sure to check back here on the Great Impressions blog each day for wonderful inspiration! 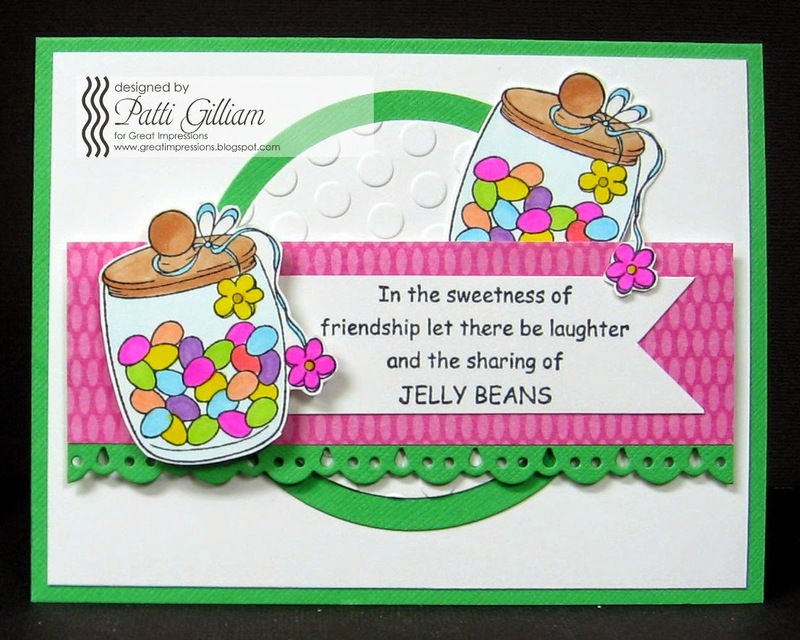 Labels: D418 Jelly Beans , E712 Jelly Bean Jar , Easter , Friendship , Jelly Bean Jar , Jelly Beans , Patti J.
Hello to all of my Great Impressions friends! 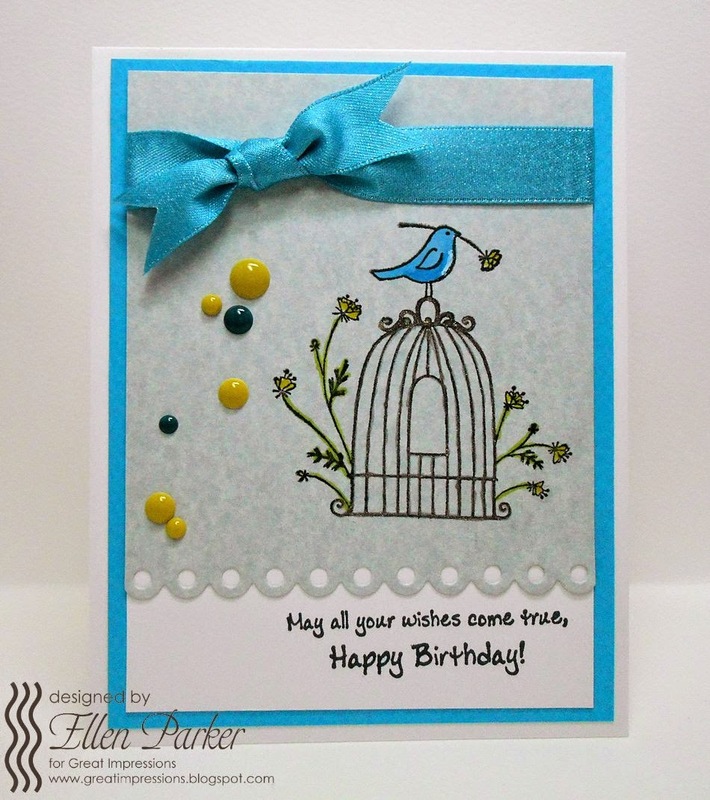 Ellen from In a World of Craft here to share some inspiration from the Great Impressions store! Are you thinking Valentines yet? I am and I have one to share with you today! Please stop by my blog to see the details and leave a little love! Be sure to come check out our current challenge but hurry! It ends today!!!! One last thing, be sure to “Like” Great Impressions on FACEBOOK and I’ll see you again next YEAR! Happy almost Valentine's Day, GI Stamps friends!!! Great Impressions will be running a 15% off sale with code Sweet from January 30th through February 1st! Sign up for our newsletter and receive codes for even more savings each month! HUGS and happy shopping!!! 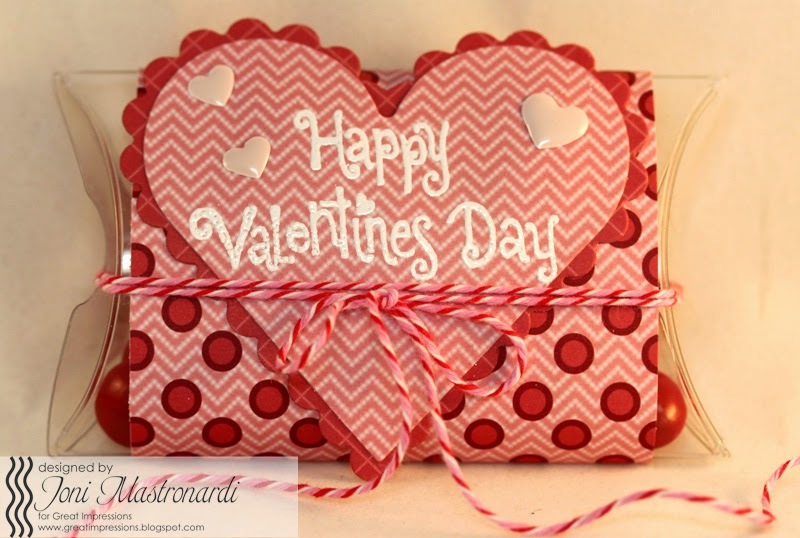 Kendra from Luv 2 Scrap 'n Make Cards here today to share a fun Valentine's Day card!! I just love the E825 Spikey the Porcupine stamp!! 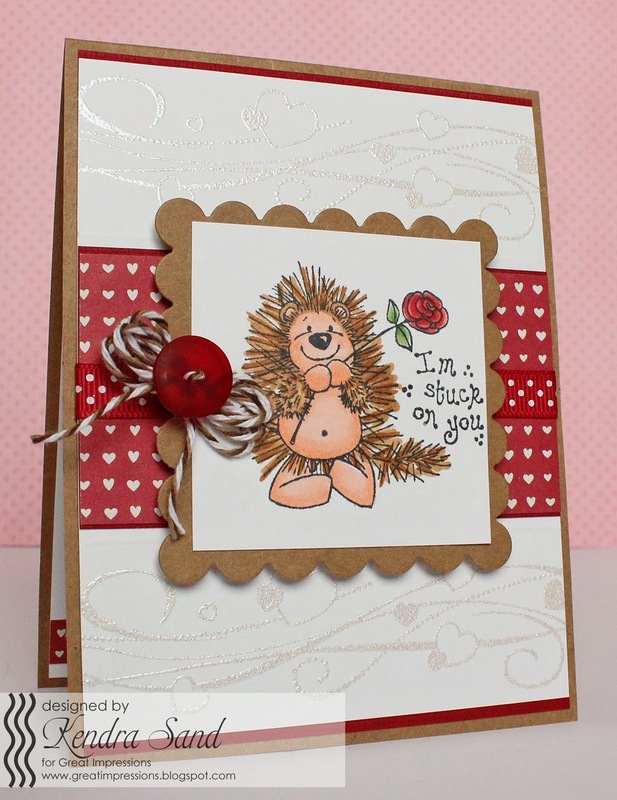 As well as the cute sentiment that goes with him, D475 Stuck on You! 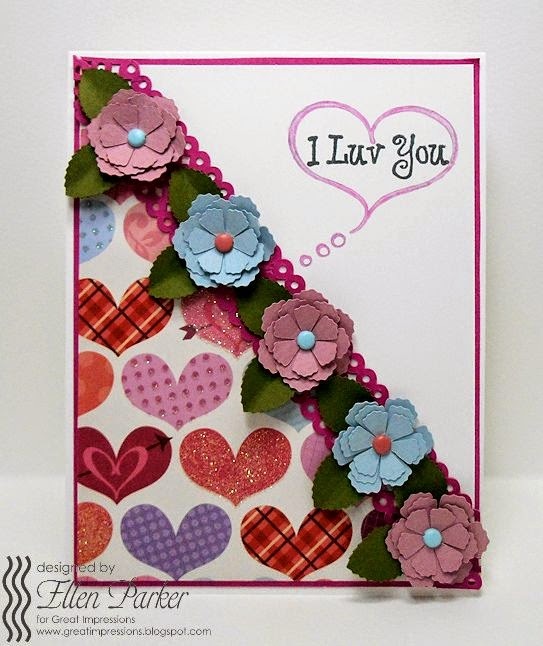 I also embossed the beautiful H172 Swirls of Hearts background stamp on my white cardstock! This week we are showcasing cute cards. Well how cute are these cows??? I stamped G516 Three Cute Cows with black ink and added some copic coloring. I popped up the G515 Thank you sentiment. It is one stamp, but I fussy cut it in three separate bubbles. Today I have a sweet baby card to share with you. When I saw this image in the Great Impressions store I just fell in love with it. Isn't the sweetest little elephant? 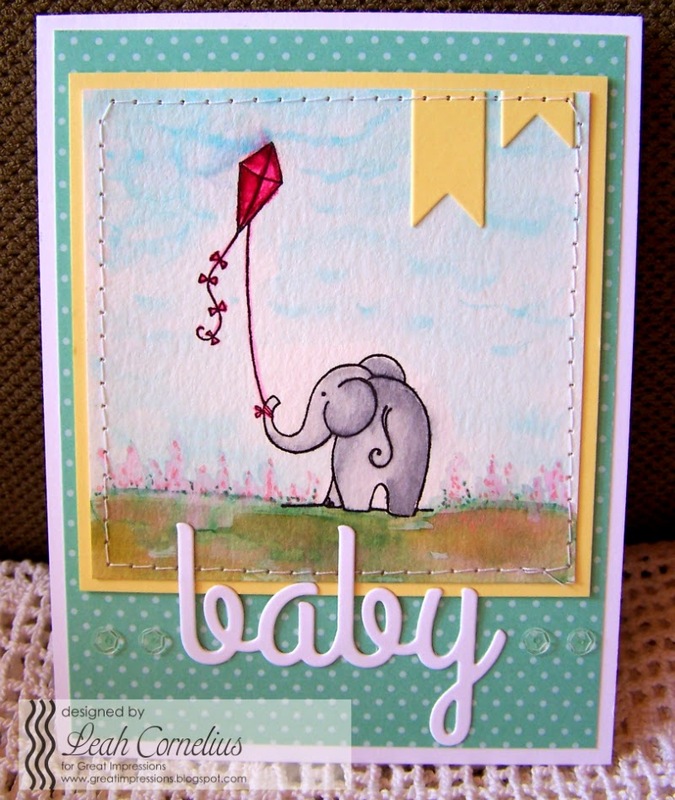 I started by stamping my image F548 Elephant with Kite onto watercolor paper. I then watercolored the image and added in some flowers and grass as well as sky. I think this image would also make a lovely thinking of you card. The first thing I did to make this card was to stamp the image, E539 Sundae, and colored it in with Spectrum Noir markers. I then added some Stickles for added shine. This was fussy cut and added to a focal panel. The sentiment is only part of B186 You're So Sweet. I stamped just the "sweet" part and punched it out. This was layered onto another oval and then added to the card with a button and silver elastic cording bow tied to yellow crocheted trim. The focal panel was then added to a card base layered with matching patterned paper, glitter paper, a doily, and some more trims on the top. Hi, everyone, and happy Saturday to you all! Gotta love a weekend, right? I had this ever-so-sweet Great Impressions Stamp, D363 Hanging Candy Hearts, and the sentiment, D364 Happy Valentines and Flowers, and just knew a wrap for candy 'conversation hearts' was in the works! Those of you that know me, know that I love a good 'box' challenge. Give me something odd sized, and I'll make a box for that item. Once your box is completed, adhere the sides. Then fold the first three flaps in. 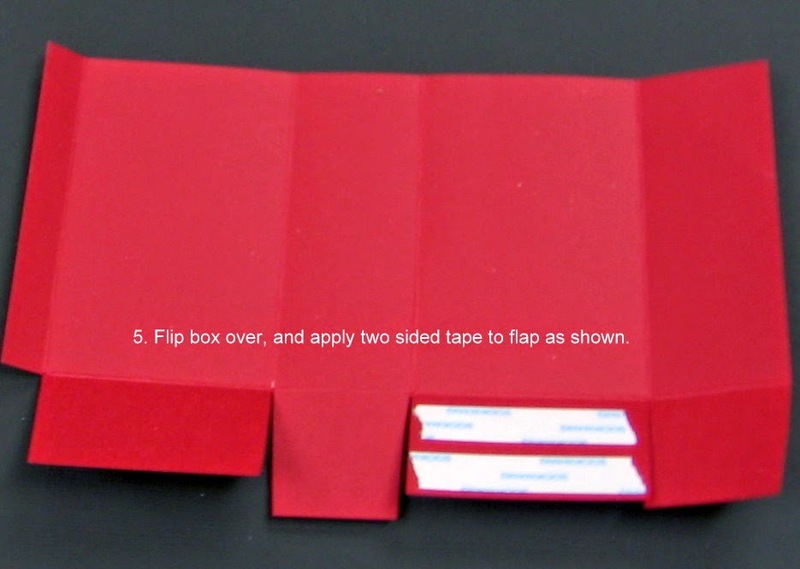 Once you have the box the way you want it, fold up and adhere the fourth flap. 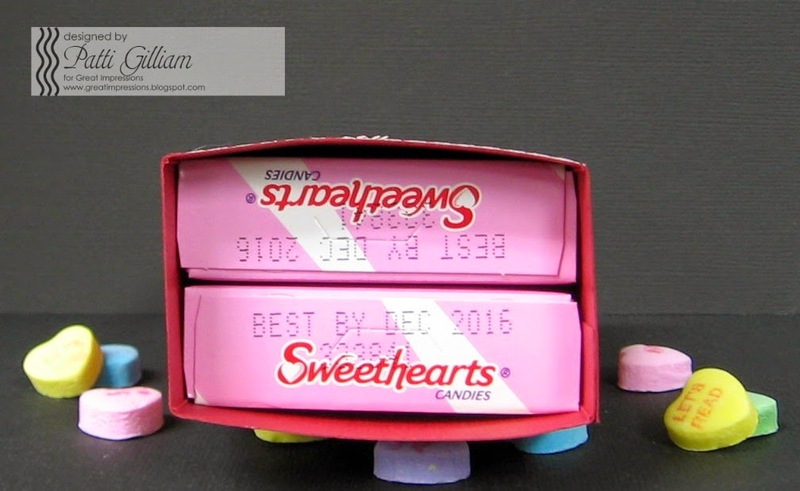 This box is the perfect little holder for two boxes of Sweethearts candy hearts. If you wanted a different treat, you could fill this box with hugs and kisses, hard candies, etc. This box could also be used to tuck in a bracelet, some handmade gift tags....the possibilities are endless! You can also experiment with different heights and widths! Well, that's it for today! 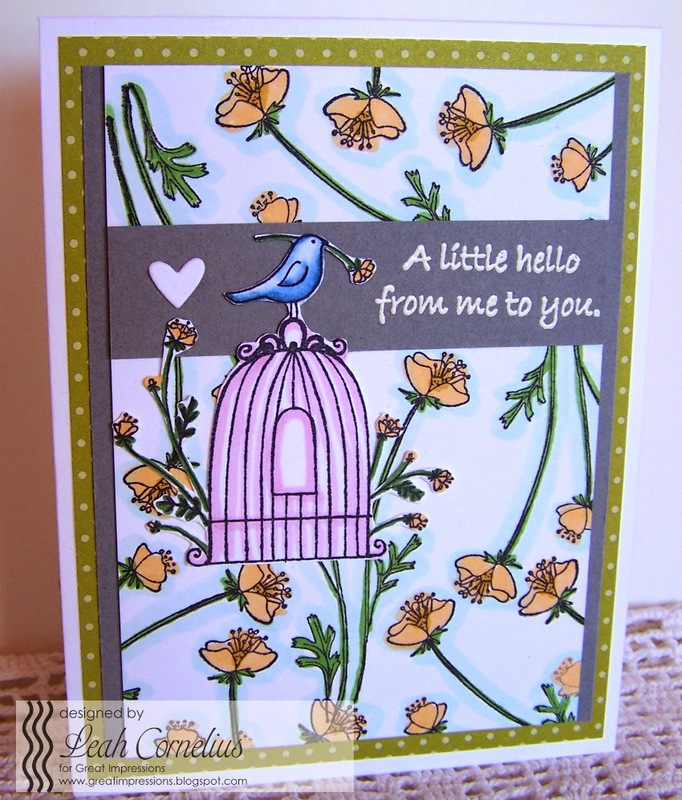 I'll be back next Saturday, with another creation using stamps from the Great Impressions store. I hope you hop over to join in our monthly challenge....'Snow Friends'...there's still time to enter! Hello to all of my Great Impressions friends! It is the fourth Friday in January and time for my Great Impressions inspiration from the Great Impressions store! OK! I had so much fun, I had to do two of these! If you want all of the details and to see all of the close up pictures, please visit my blog! 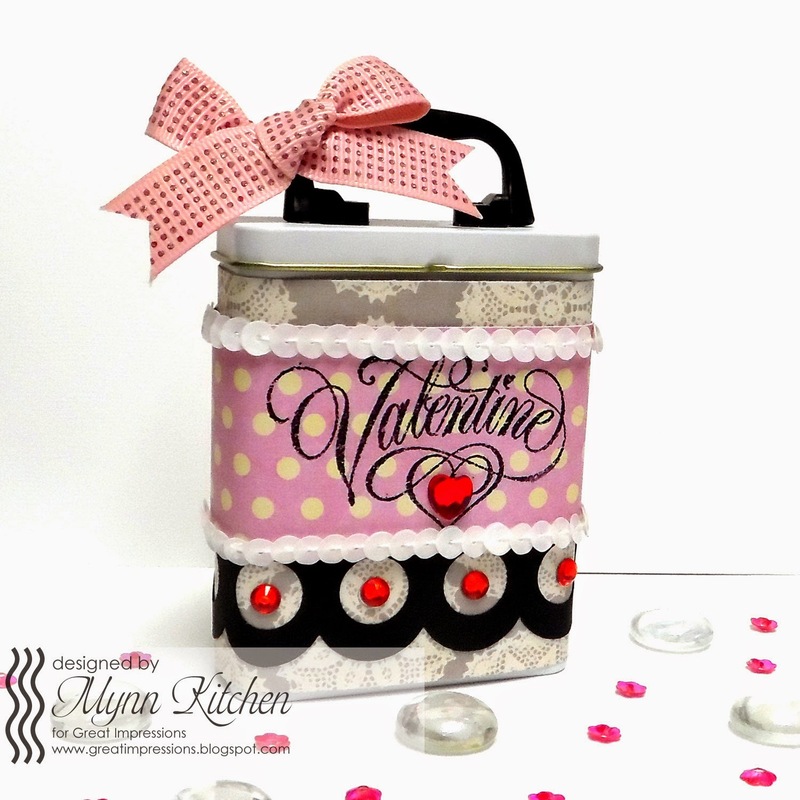 Kendra from Luv 2 Scrap 'n Make Cards here today to share my Valentine Candy Packaging! What a fun week this is, with all the lovely packaging being posted!! 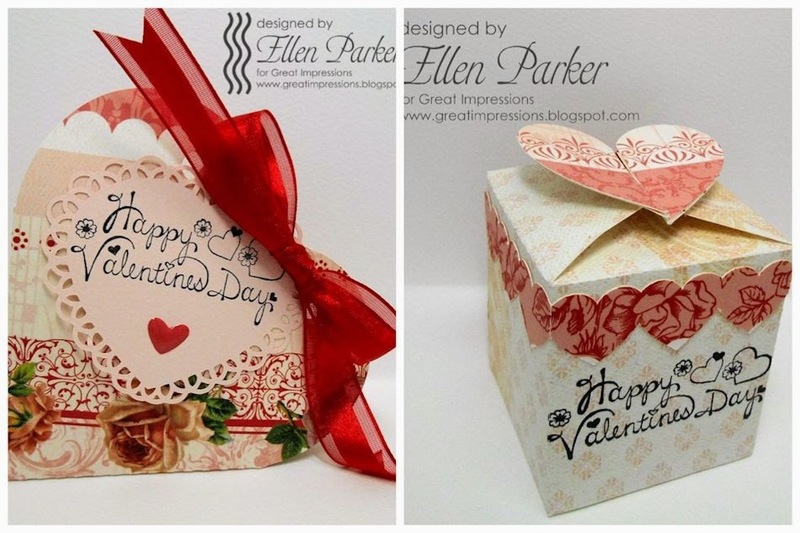 Today I am sharing 3 packages I created, that hold Hersey Kisses inside! I used the B188 I Luv You stamp for my sentiment on all three packages. 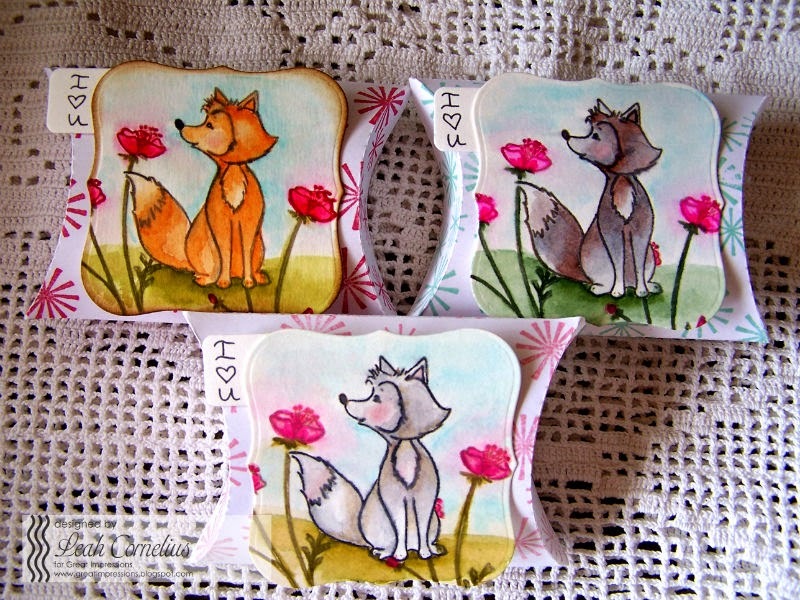 On the two back packages, I stamped the H172 Swirls of Hearts on patterned paper, to add some extra pattern. A nice added touch!! 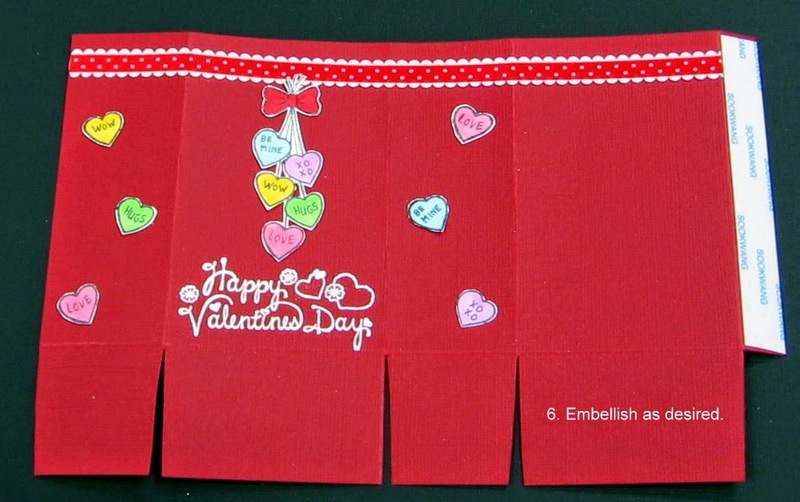 Today I have a candy pouch filled with red M & Ms ready for Valentine's Day! I used a ready made plastic pouch and wrapped it with some Valentine's paper. I die cut a heart and a scalloped edge heart. I stamped the sentiment D474 Happy Valentine's Day unto the heart and embossed it with white embossing powder. I added some twine and enamel hearts for embellishments. We're featuring Valentine treat holder ideas this week and this one was actually pretty quick and easy to make! I started by adding some patterned paper to the little tin. I then added a strip of punched black cardstock and some red rhinestones. 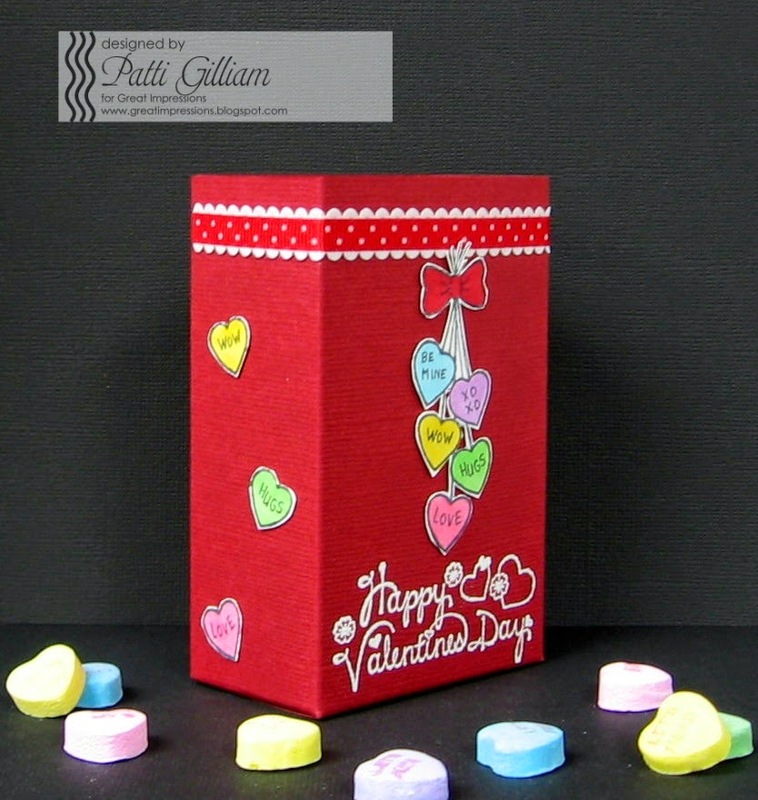 I stamped and heat embossed E330 Valentine on some polka dotted patterned paper and added that to the tin. Some sequin trim and a red heart rhinestone were added for more shine and whimsy. I then added a bow to the handle of the tin. This fun pink sparkly polka dotted ribbon seemed the perfect choice. The ends were trimmed like banners to add more of a finished look to the bow. The completed project is the perfect little holder for some treats. You could throw some Kisses into it or even some chocolate squares. 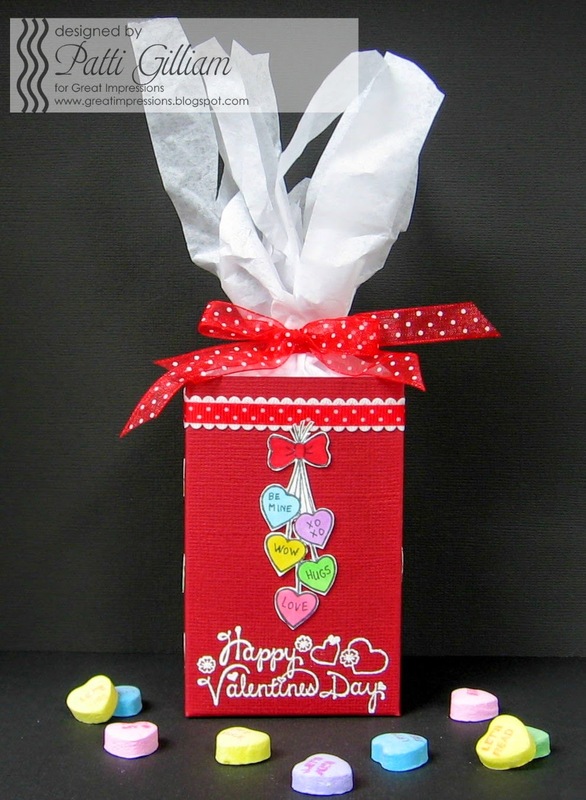 If candy isn't for your Valentine, a bracelet or some small cards could also be tucked inside instead! What do you think of the final project? It's another weekend - happy Saturday, everyone! With Valentine's Day coming up soon, I thought it would be fun to showcase some of the Great Impressions 'Heart' stamps. Today's card uses 'The Two of Us - C395, and 'Love Chicks' - B189. 1. Draw pencil lines lightly across the 5" x 5" piece of cardstock. 2. Lightly pencil around the red scalloped circle mat, for placement of sentiments. 3. Using Stamp-a-ma-jig, stamp the sentiment on each line. 4. 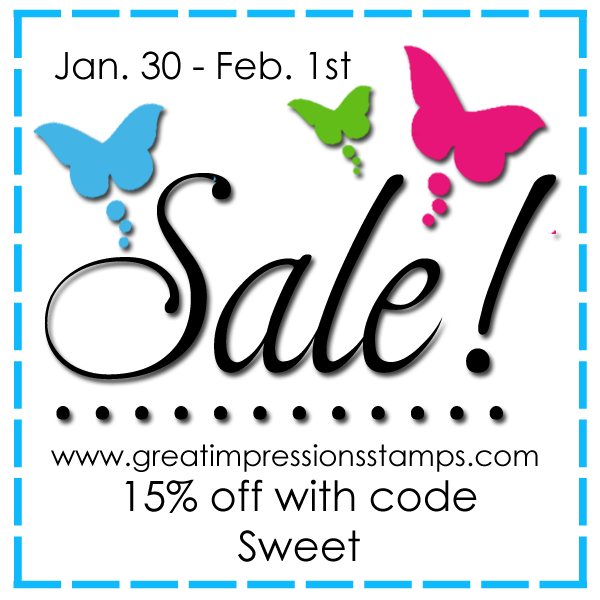 Color the image, and add a dash of color to each sentiment's 'heart'. 5. Adhere the image to the red scalloped circle mat. 7. 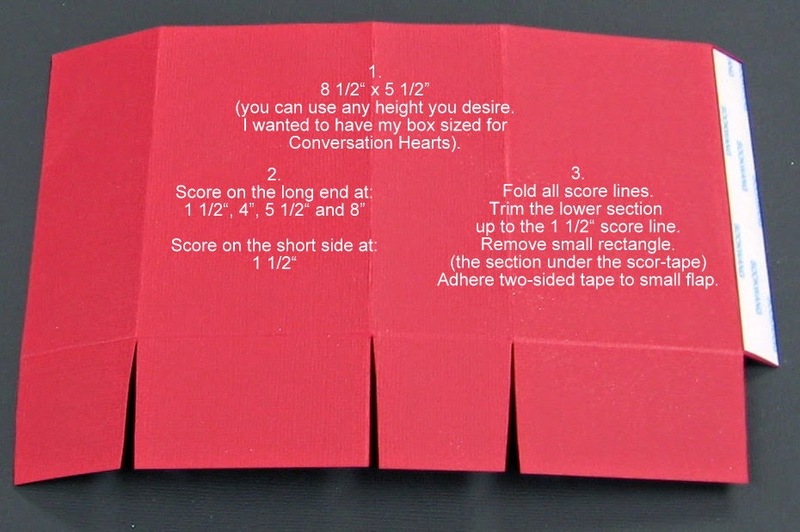 Adhere the image to card front, using dimensional foam. to enter our monthly challenge 'Snow Friends', HERE - can't wait to see your creations! Hello to all of my Great Impressions friends! It is the third Friday in January and time for my Great Impressions inspiration from the Great Impressions store! 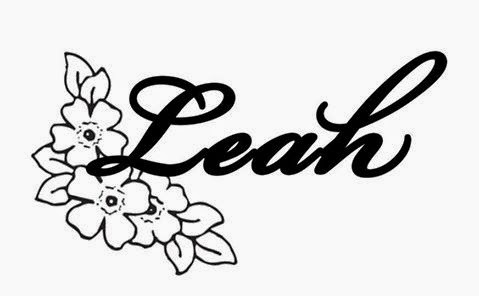 Have you checked out my blog? Please do drop by to get all of the details on this card! Occasionally in summer I love to send my kids cards to the cabin, so when we are there they get some mail! It's those "little" things that mean so much! So when I seen the new E856 Hello Louie I knew it was a must have for a card for my son!! I also used the fun new B242 Duckin' In sentiment! Perfect to put a smile on a kid or even an adult!! 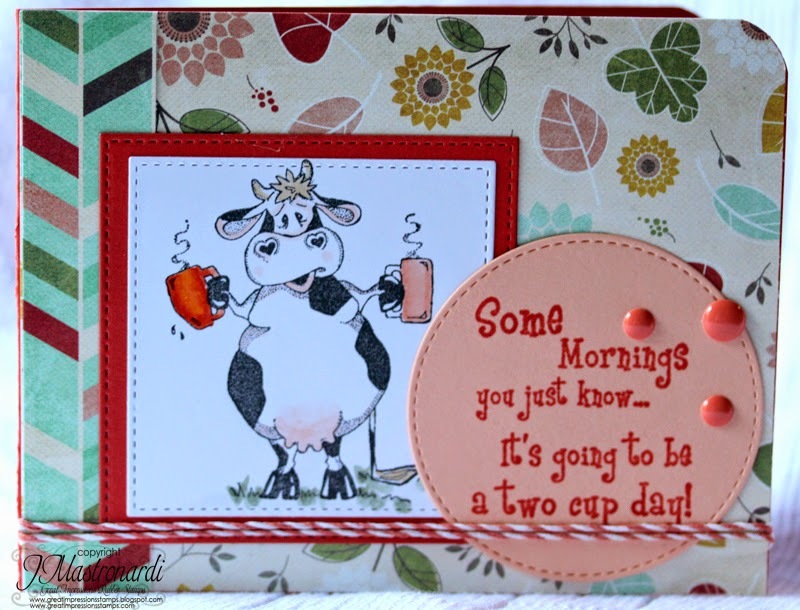 I just love the new cow stamps from Great Impressions. Here I have F596 Two Cup Cow. I stamped the image with black ink and did a bit of copic coloring. I added the sentiment D491 Some Mornings. Yes, some mornings it is going to be More than a Two Cup Day! Be sure to join us for our monthly challenge: Snow Friends! Details on my personal blog HERE. When I first saw this image and the sentiment that matched it, I fell in love! 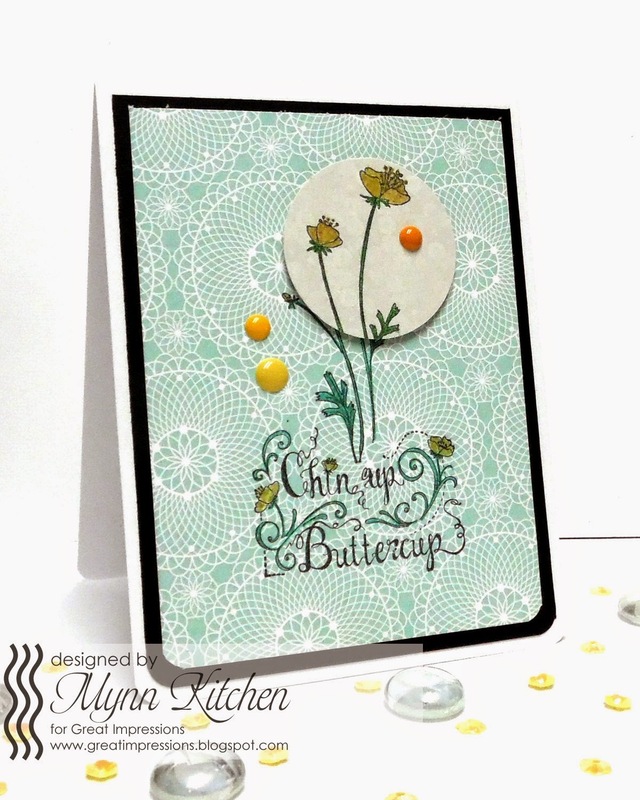 I started by stamping the image, F599 Buttercup Flowers, onto some patterned paper. 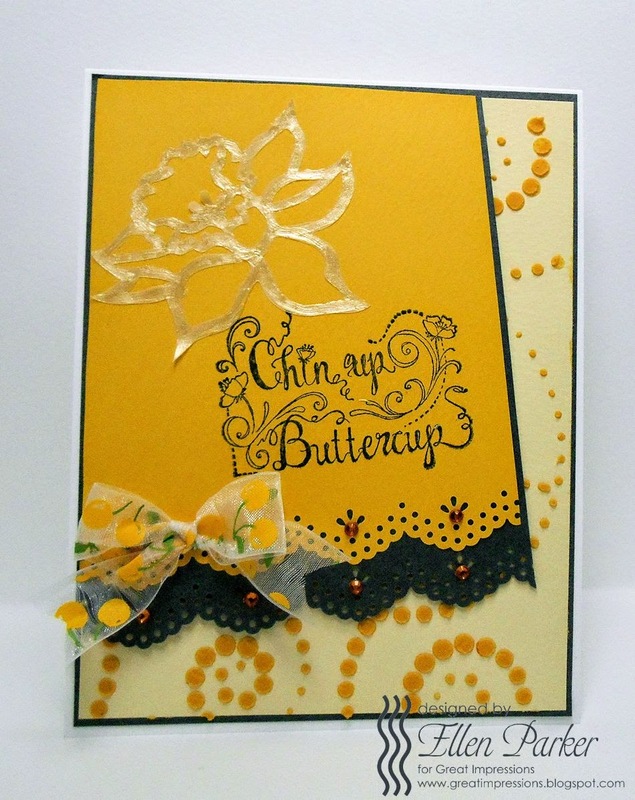 I then stamped the sentiment, E855 Chin Up Buttercup, below the image. I colored these two things in with glitter gel pen. I then decided that the image needed to be more prominent. I decided to do a little spotlighting. I stamped the image again onto some glimmery paper and then colored it and punched a circle out. I added it to the card with a few enamel dots. Perfect! The result is a semi-CAS creation that used up some of the paper I was storing in my stash. Perfect use of it, actually! I like it a lot. What do you think? Do you like it? I'd love to hear what you think in the comments below! Hi there, and Happy Saturday! that I thought this bicycle looked like something happy to create with today. Great Impressions D405-Just Me.Thinking of You. our city name are all accented with Glossy Accents. to give them a bit of dimension. Hope you'll follow our blog, for daily inspiration! Need stamps? Check out the Great Impressions Store - wonderful selection and great prices! And...don't forget to enter our January challenge, 'Snow Friends'! We'd love to see your creations! You do not have to use a Great Impressions Stamp, but we'd love it if you did! If you use GI stamps, be sure to leave a comment on the challenge post, and you'll have two chances to win! Labels: D405-Just Me.Thinking of You. , F203-Garden Bicycle , Garden Bicycle , Just Me. Thinking of You , Patti J.
Hello to all of my Great Impressions friends! It is the second Friday in January and time for my Great Impressions inspiration from the Great Impressions store! 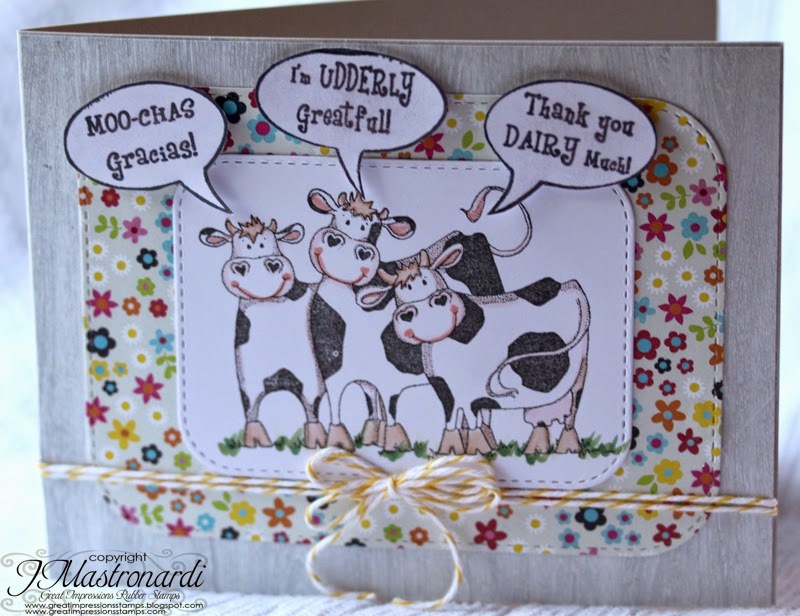 I hope you will take a second and jump over to my blog and get all the details on this card. While you are there, leave a little love! Hope your New Year is off to a wonderful start! 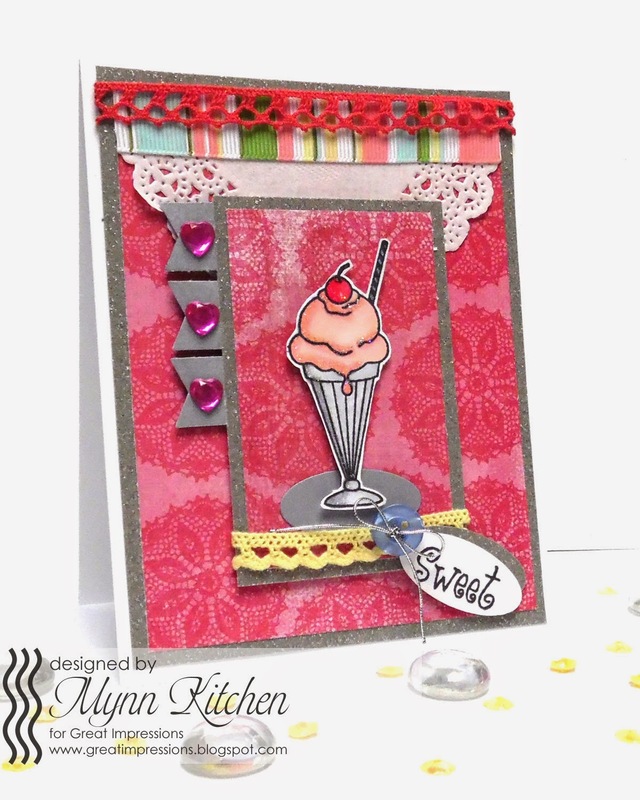 Kendra from Luv 2 Scrap 'n Make Cards here today, I will be posting on Thursday's this year!!! I am in LOVE with the new E858 Dancing Cat! My daughter is in dance classes and absolutely loves it! So I instantly thought of her when I seen this new stamp! 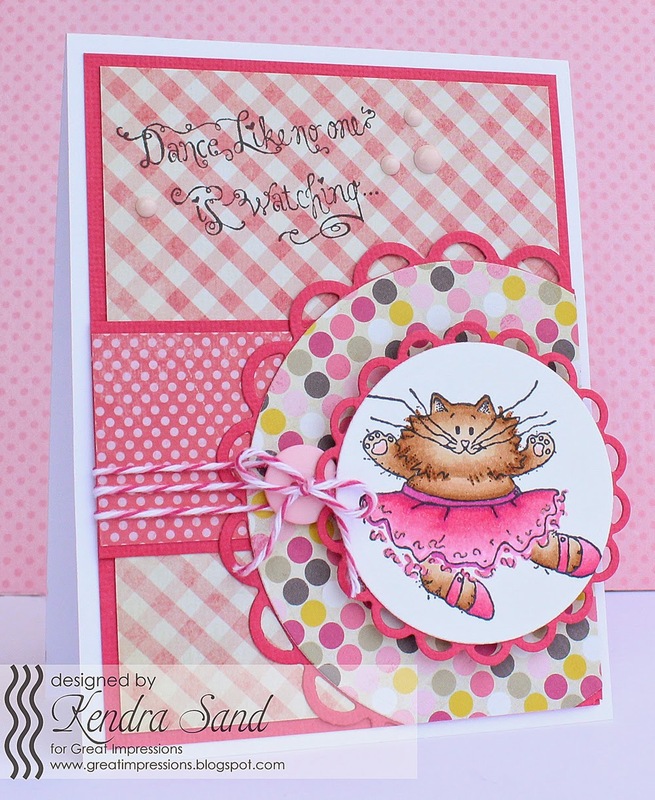 I also used the fun new E857 Dance sentiment!